This is our favorite corkscrew in the tasting room and at the table. Pulltap is a unique professional corkscrew. Not just a waiter's friend, but a waiter's favorite. Professional grade, strong. Ergonomical design, small size and light, it fits perfectly in your hand. The double lever system used by Pulltap's corkscrew is the best system to extract even the toughest corks. In a completely vertical position and without rough movements of the wine bottle. This system is patented by Pulltex, made in Spain and has the engraved official Pulltap logo. The cork is pulled out vertically and the bottle is opened quickly and easily. A five turn teflon coated worm and a micro serrated steel blade for capsule cutting. Bottle opener and lead remover. High resistant, best quality metal materials. Efficient and durable. Available in multiple colors. 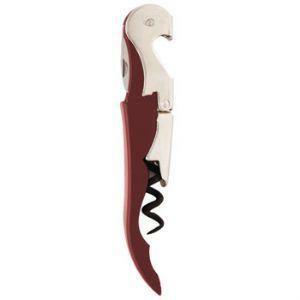 Best corkscrew for hard to open bottles or winelovers without a lot of hand strength. Best corkscrew for opening lots of bottles. 1) Remove the top part of the wine bottle capsule using the Pulltap's knife. Close knife. 2) Open the Pulltap and screw the worm into the center of the cork until the entire spiral part of the worm is imbedded in the cork. 3) Place the catch closest to the worm on the lip of the bottle and use the lever to get the cork started. 4) Then place the catch furtherest from the worm on the top of the bottle and remove the cork. If there's difficulty, rotate the Pulltap 180 degrees around the bottle lip and try again.